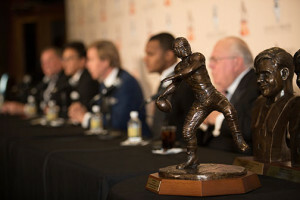 The second annual show will feature interviews with 2015 Davey O’Brien National Quarterback Award winner Deshaun Watson, Legends Award presented by Low T Center recipient Craig Morton and Charles Ringler Founder’s Award winner Verne Lundquist. 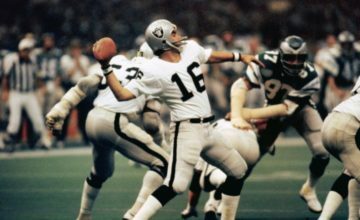 Former Davey O’Brien Award winners Jim McMahon (1981), Don McPherson (1987), Eric Crouch (2001), Brad Banks (2002) and Colt McCoy (2009) also will be featured. 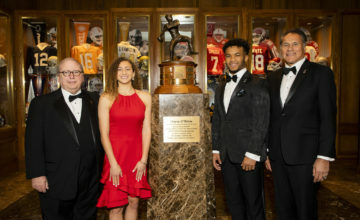 In addition, Board of Trustees member David O’Brien Jr., Dallas Cowboys broadcaster Brad Sham and SMU head coach Chad Morris also sat down for interviews prior to the 39th annual dinner Feb. 15 at The Fort Worth Club. The show will air 15 times throughout the month of March, beginning Tuesday (March 8) at 10:30 p.m. (CT). It will re-air on the channel on March 12, March 16, March 21, March 22 and March 26. Check local listings for the time and channel.